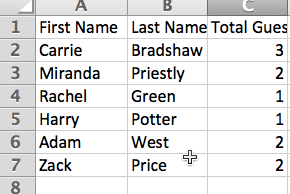 Make sure to account for all guests with a "Total Guest" Column on the guest list excel. ‘Total Guests’ is not the number of additional guests coming with the main guest, it is the total number of guests including the main guest. No RSVP = 0 Total guest. This is to account for anyone not expected to come and won't count them toward total guest count. Choose NO RSVP after importing when it asks you to assign a default value. Main Guest only = 1 total guest. Main Guest+1= 2 total guests. Main Guest +2 = 3 total guests and so on. zkipster recommends adding a Custom Field for the Guest's Names on the excel so that check-in teams have that information readily available when checking in guests.